Highway 6 crosses the Suwannee River about 5 miles below Turner Bridge Landing. Just to the west of the bridge is where the Woodpecker Route intersects with Highway 6. The Woodpecker Route is paved to the south of Highway 6 and a dirt, graded road to the north of Highway 6. Take the first dirt road to the west of Highway 6 bridge. Go north on the dirt road for about 4 miles. Turn right (east) on the dirt road with the sign pointing to Roline Landing. Highway 6 crosses the Suwannee River about 5 miles below Turner Bridge Landing. Just to the west of the bridge is where the Woodpecker Route intersects with Highway 6. The Woodpecker Route is paved to the south of Highway 6 and a dirt, graded road to the north of Highway 6. Take the first dirt road to the west of Highway 6 bridge. Go north on the dirt road for about 4 miles. Turn right (east) on the dirt road with the sign pointing to Turner Bridge Landing. There is not a bridge crossing the river. Only the old pilings and a few railroad ties are left of the old railroad bridge. At Turner Bridge Landing there is a small county park with picnic shelters and parking area. There is no power, no restrooms, and no potable water. Only river water is available at the park. A concrete boat ramp can handle small boat trailers, depending on the river level. It is very easy to launch canoes or kayak from the ramp. Turner Bridge Park is inside The Cypress Creek State Wildlife Management Area, but the Park is managed by Hamilton County. A small dirt trail going down to the river is on the north west side of the Highway 6 bridge. It is possible to launch canoes and kayak from there. A dirt road turns off the Woodpecker Route near Prospect Church going west. The Woodpecker Route is a paved, two lane highway between White Springs and Highway 6. It is a dirt, graded road above Highway 6. There is no Cone Bridge. It fell in the river years ago. The launch site is still called Cone Bridge Landing. The launch sites can be accessed from both sides of the river. From the west (Hamilton County) side a dirt road turns east off the Woopecker Route. From the east side there is a dirt road which turns west off Highway 441. There is a sign on Highway 441 pointing to Cone Bridge Landing. There are no ramps or facilities. Canoes and kayaks can be launched at the sand bar. A dirt road turns east off the Woodpecker Route going east about 5 miles north of White Springs to the Big Shoals State Recreational Area. There is a sign marking the road. After a few miles the dirt road turns into a small paved road. A park ranger is stationed in the Big Shoals area. There is a small fee to use the park. The Big Shoals area has picnic tables, public restrooms, and canoe launch. The canoe launch is about 200 feet from the road. Canoes have to be carried by hand from the road to the launch site. Wooden steps go down the steep river bank to the canoe launch. Big Shoals area also has many marked hiking trails. On the Columbia county side of the Highway 41 bridge a dirt road turns off between the bridge and the DOT truck inspection station. The dirt road goes about two miles the splits. Take the right hand turn to get to the Little Shoals access point. The road ends in a parking area about 100 feet from the river. A small hiking trail runs from the parking lot to the river. The banks are very steep and launching is difficult. When the river is in flood stage water comes up over the road to the Little Shoals access and it is not possible to launch there. A small roadside park with picnic tables and concrete boat ramp is on the Hamilton County side of the river at the Highway 41 Bridge. There is no power and no potable water at the park. There are no restrooms. 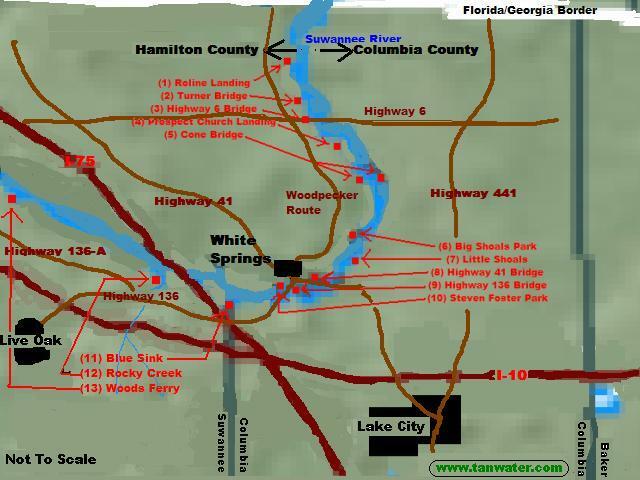 The park is only about half a mile outside of White Springs where there are convienience stores and restaurants. Canoes and kayaks can be launched on the down river side of the Highway 136 bridge. Turn in the little dirt trail between the DOT truck inspection station and the bridge. No ramp, but launching is not too difficult. Steven Foster State Park entrance is in White Springs. There is a $4 per vehicle fee to enter the park. A canoe and kayak launch ramp is near the River Walk. The dirt road going to the Blue Sink Tract turns off Highway 136 just to the east of where Highway 136 crosses Interstate 75. Launching and pulling canoes or kayaks at Blue Sink mouth is difficult and the trails going in are often in bad shape. Roads may be flooded if the river is high. It is possible to launch at where the Blue Sink run-off goes into the river and there is another little dirt trail on past Blue Sink that goes all the way to the river bank. Launching from there is much easier than putting in at the Blue Sink run-off. Banks are steep and there are no ramps. Roads might be in bad shape. Blue Sink Tract is state land and is controlled by the Suwannee River Water Management District. A dirt road turns off Highway 136-A right beside the Pine Grove Methodist Church. Follow the dirt road to the end. There is not much parking room and the banks are very steep, but a canoe or kayak can be lowered to the water by rope. Pulling a canoe is very difficult at Rocky Creek. Dusty Road (there is a sign) turns off Highway 136-A about a mile west of the Pine Grove Methodist Church. Follow Dusty Road in to the Woods Ferry Tract. The dirt roads are pretty good until you reach the Woods Ferry Tract roads. There are wooden steps going down the bank to the sand bar at the Woods Ferry launch site. Just up-river from the Woods Ferry launch site is an over night camping area for canoe and kayak travelers. Launching or retrieving at Woods Ferry is fairly easy. CAUTION - Water level in the upper Suwannee River will determine whether you can navigate from one access point to another. In some places the water will not even float a loaded canoe when the water level is very low in the upper Suwannee. There may also be dangerous rocks or sunken limbs. Water will be falling up to 10 feet at Big Shoals during low water conditions and the fast shallow water levels combined with sharp rocks between Big Shoals and White Springs can do great damage to canoes or kayaks. Check river water levels before planning a trip!